Best Masters in Psychology, an online source for prospective University students, has ranked Texas A&M International University’s (TAMIU) Master’s Degree in Psychology programs No. 16 among the 49 most affordable master’s degrees offered by small colleges. The ranking, which includes TAMIU’s Master’s of Arts in Counseling Psychology and Master’s of Science in Psychology programs, focuses on the most affordable small colleges for a master’s degree in psychology and was developed using data from the NCES College Navigator database. Dr. Sara Castro-Olivo, program director of the TAMIU Master of Arts in Counseling Psychology (MACP), said the recognition provides an optimum opportunity for the program to recruit students nationally and internationally. Dr. Anna Cieślicka, director of the TAMIU Master of Science in Psychology (MS in Psychology) Program, said the Best Masters in Psychology ranking provides a powerful incentive to attract more students from out of state. “TAMIU’s Masters in Psychology program has recently expanded its offering, making it potentially attractive to an even wider pool of potential candidates,” she explained, “In addition to offering state-of-the-art psycholinguistic and neuropsychological research tools for those students interested in pursuing research – for example, eye-trackers or equipment for measuring EEG or ERPs of the brain – TAMIU opened a non-thesis, internship track, and students are able to apply hands-on their theoretical knowledge in community-based workplaces. “We are continuing to expand our course offerings and hoping for the program to continue its growth; this recognition is an important milestone in achieving our goals,” Dr. Cieślicka said. 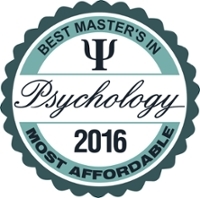 BestMastersInPsychology.com’s mission is to connect students with information about choosing a graduate degree in psychology, as well as valuable resources needed to flourish as psychology professionals, said Jamie Weitl, communication’s manager for the website. For more information, please contact the Office of Public Relations, Marketing and Information Services, at 326.2180, e-mail prmis@tamiu.edu or visit offices located in the Sue and Radcliffe Killam Library.